A National surveys suggest decreases in religious involvement, especially among young adults. In contrast, the findings from the study we will discuss in this webinar are that adolescents and young adults (AYAs) who face serious illness have important religious/spiritual (R/S) questions and rely heavily on R/S resources to help them cope. 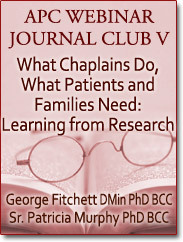 In this webinar, we will learn why the study authors recommend that chaplains should be "more proactive in responding to the R/S needs" of these patients. We will also describe how replication of this study can help chaplaincy departments advance an evidence-based approach to chaplaincy care. 1. To make chaplains aware of the ways that adolescents and young adults turn to R/S to cope with serious illness. 2. To encourage chaplains to use qualitative research to deepen their understanding of their patients' R/S needs and resources. Reference: Ragsdale JR, Hegner MA, Mueller M & Davies S (2014). Identifying religious and/or spiritual perspectives of adolescents and young adults receiving blood and marrow transplants: a prospective qualitative study. Biology of Blood and Marrow Transplantation, 20, pp. 1238-1257.